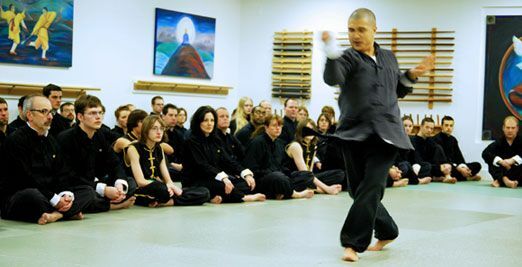 Zen Martial Arts (ZMA) is a philosophy which uses the path of martial arts to strengthen the mind, body, and spirit. We teach the most practical and efficient self defense techniques covering all ranges: punching, kicking, throwing, choking, locks, submissions, and grappling, all practiced in a safe, clean environment. Our workouts are all technique based, so that the student develops skills through repetition which develops muscle memory. In every class, we focus on four categories of fitness: cardiovascular, flexibility, strength training, as well as meditation. We believe that the mind and body need to be healthy and strong. One of the keys to our program is the balance between traditional techniques that have been handed down for thousands of years and modern training methods that are safe and effective. Each class is overseen by instructors who are masters of disguising repetition, guaranteeing that every class will be challenging and fun. The techniques we practice are similar to every other martial art school: punches are punches, kicks are kicks, throws are throws, grappling is grappling. But WHAT we practice is the uniqueness of ZMA. We measure success in our students not only by rank, but how their lives improve. By increasing concentration, reducing stress, and raising confidence, we help students become masters over their actions, rather than prisoners of their reactions. In ancient cultures, students studying martial arts disciplines did not practice to obtain a rank or belt. They practiced to develop themselves, physically, mentally and spiritually. A physical workout and self defense skills combined with an emphasis on meditation and introspection is the real essence of true martial arts.